Longtime San Marcos resident and LBJ Museum Board of Director member Pat Murdock was recognized by the City of San Marcos for her public service and overwhelming contributions to the city over the years. 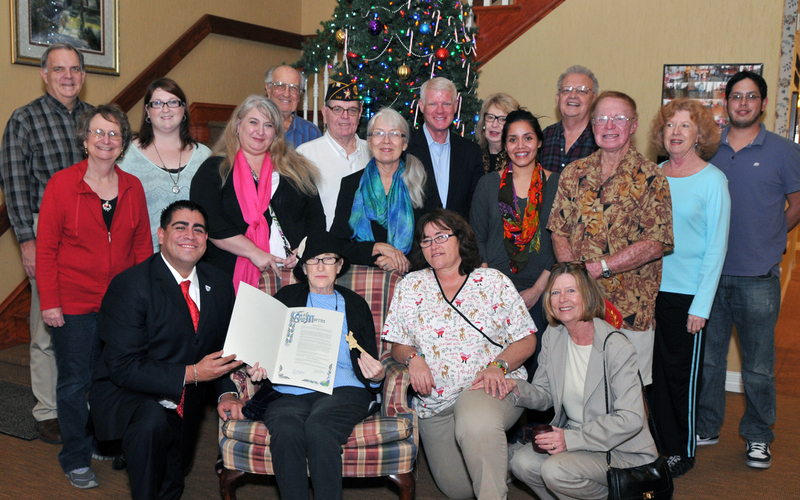 Mayor Daniel Guerrero presented her with a Proclamation from the City of San Marcos thanking her for her faithful service since 1959 and designating, Friday, December 20th as Pat Murdock Day. Mayor Guerrero also presented her with a key to the City of San Marcos. The Board of Directors of the LBJ Museum of San Marcos would like to join the city in its appreciation of all that Pat has accomplished for the betterment of San Marcos. And call upon the people of San Marcos to recognize Pat Murdock’s extraordinary love, devotion and contributions to Texas State University and the people of San Marcos. CITIZEN EXTRAORDINAIRE PAT MURDOCK is honored by Mayor Daniel Guerrero and friends from the many civic organizations to which she contributes as a volunteer and mentor. Ms. Murdock worked for 50 years at Texas State University, many as Director of the University’s News and Information Service. She is renowned for her contributions to local veterans, the Veterans Affairs Advisory Committee, the American Legion Auxiliary, League of Women Voters, San Marcos Convention & Visitor Bureau, Friends of the Cemetery, the 2001 Sesquicentennial, and the annual July 4 SummerFest Celebration, to name a few. L-R, front, are Mayor Guerrero, Pat Murdock, Renae Hill, and Teresa Schwartz; Back Row: John McCrocklin, Melissa Millecam, Jennifer Mach, Lisa Morris, Ted Breihan, Tom Tvrdick, Dianne Wassenich, Scott Gregson, Peggy Townes, Elizabeth Delgado, Sherwood Bishop, Red Jureka, Carolyn Goss, and Ralph Garcia. (Photo by Don Anders).